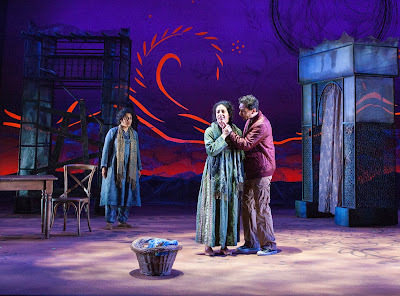 Over the past year, A Thousand Splendid Suns has moved audiences across Canada and at San Diego's Old Globe. But this story of three resilient Afghan women has also captivated the show's cast, some of whom have been a part of this production since its world premiere at A.C.T. in February 2017. Before Suns's limited two-week run at The Geary Theater this month, we spoke to three of the cast members to hear what this moving story means to them. A.C.T.’s A Thousand Splendid Suns (2018). Photo by Jim Cox. Nikita Tewani (Aziza): The stories of the country, culture, and people portrayed in A Thousand Splendid Suns are largely untold. If they are in the media, the representation is more often than not a negative one. Every time I step on that stage, I am honoring these people: women who normally don’t get to share their stories. This play shows the humanity of what’s really happening in these countries—why refugees become refugees and why they need our help. Our world needs stories like this right now. As an actress of color, I don’t get the opportunity to tell meaningful stories as much as I would like. It’s sharing stories like this that reminds me why I do what I do. Jason Kapoor (Abdul Sharif, Jalil, Wakil): Suns speaks to the power and resilience of humans when they work together. This story is heartbreaking, but so hopeful at the same time. Getting to work on the world-premiere production is an extraordinary opportunity. Although acting in this show can be physically and mentally exhausting, the chance to revisit characters I’ve struggled with and traveled with was hard to pass on. Denmo Ibrahim (Mariam): Projects like Suns are far and few between. To work with a composer who not only scored the piece with you in the room, but plays live, who can respond to you onstage in every show, to be able to tell a story connected to my own culture, to place Muslim women center stage and give voice to the Mariam’s, Laila’s, Aziza’s, Fariba’s, and Nana’s of the world, to live and breathe life into one of the greatest characters I have ever had the good fortune to play, to stay with a company for years on a project, to grow and create with them, these are just some of the things that keep me returning to this play. With Suns, there will always be something more for me to learn, a deeper invitation to understanding what it means to be vulnerable, to be curious, and to be human. A.C.T.’s production of A Thousand Splendid Suns runs through July 29 at The Geary Theater. Click here to purchase tickets. Want to learn more about the story of Suns? Order a copy of Words on Plays, A.C.T.’s in-depth performance guide series.